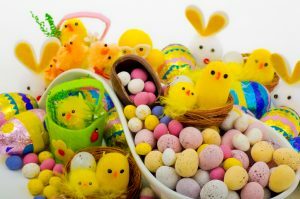 The Team at the orthodontic office of Dr. Lisa P Howard DDS MS realizes Easter is a time of joy and celebration but asks parents to be smart when doling out the candy to their children. Candy is meant to be a treat, but even when consumed in moderation some varieties push the wellness envelope. To have your sweets and stay healthy too, limit candy that’s particularly high in sugar, unhealthy fats and artificial ingredients. Some types of candies can be more dangerous to the teeth. Candies such as Sour Patch Kids, Candy Corn, Butterfinger bars and even M&Ms and Jelly Beans contain artificial dyes and tons of sugar and other ingredients that can get stuck in teeth. If you have any questions or would like to schedule a complimentary exam, please feel free to contact our office in Scarborough ME. Happy Easter!